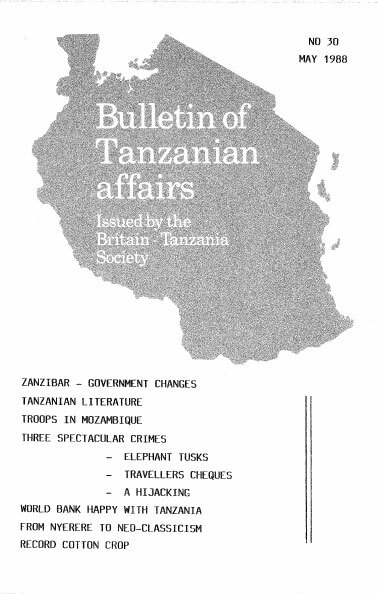 Readers of this Bulletin will recall that developing differences of opinion in Zanzibar first came into the public eye in July 1987. We quoted from a Daily News column (Bulletin No 28) to the effect that Zanzibar Chief Minister, Seif Shariif Hamad had “blamed the restive political situation on disgruntled elements who are disillusioned by the socio-political changes which have steadily whittled away their personal prestige and economic interests”. Mr Hamad had denied that by accepting aid from Gulf countries or by liberalising trade the Zanzibar Government had abandoned socialism or compromised on the Isles’ sovereignty. Readers will recall also that political rivalry between Mr. Hamad and the President of Zanzibar, Mr. Idris Wakil, goes back at least to the time before the last Presidential elections in 1985 when Mr. Hamad was beaten by Mr. Wakil as Party candidate for the Presidency of Zanzibar. Mr. Hamad received 80% support in Pemba; Mr. Wakil got almost the same in the other island, Unguja. The fact that Mr. Wakil was subsequently elected President by a very small majority (Bulletin No 23) indicated the strength of Mr. Hamad’s support. The subsequent appointment by President Wakil of Hr. Hamad as Chief Minister was clearly a brave attempt to ensure Zanzibar’s future unity. For it to succeed however the two main parties (Wakil and Hamad) had to work closely in tandem. This apparently did not happen. And so we come to the bombshell of January 12, 1988. President Wakil revealed that the Government had information that funds were being secretly collected to buy arms and hire mercenaries to invade Zanzibar. He said that those behind the plan were going about telling people that they wanted to liberate the island from foreign rulers. He reminded the people that Zanzibar was part of the United Republic of Tanzania and that any invasion of the Isles would be an invasion of Tanzania as a whole. Observers of Zanzibar’s always volatile political scene have suggested that various factors may have influenced the recent Government changes. It was Pemban nationalism say some. Many people in Pemba have long felt that their island is neglected by those in authority in Zanzibar. It was Zanzibar nationalism say others. A feeling that Zanzibar is an unequal partner in the Union. Or, perhaps the changes were linked to different attitudes to Tanzania’s trade liberalisation policies and, in particular, to the former Chief Minister’s encouragement of increased Omani and Arab investment in the islands. To Mlamali Adam in Africa Events it was a case of obsession with the past and racism. “The summary dismissal of Chief Minister Seif Shariff Hamadi, the purge of his presumed sympathisers from the Civil Service coupled with the ill-disguised court intrigues are a sideshow, a diversion even, from what lies at the heart of the matter. The trouble with the islands, or with some of its leaders at any rate, is obsession with the past and – not to put too fine a point on it – with racism . . …. The truth is that Hamadi was unwanted from the beginning. Coming from Mtambwe, Pemba, he is the wrong shade of black, has wrong ancestors and his parent’s relatives made the mistake of enrolling in the wrong Party, all of thirty years ago. Therefore, Seif, like blacks in South Africa, must now pay for ‘original sin'”. “The people of Zanzibar last Monday spat on the face of the country’s detractors when they staged a mammoth rally in support of President Wakil’s speech to the House of Representantives. In the speech, the President decried elements of confusion inside and outside the islands ‘and the mainland and called for collective determination to frustrate the detractor’s moves. In a show of support unprecedented in the history of their young country, the Zanzibaris called for the blood of the divisive elements, urging the Government to expose them, remove those inside the country from their responsible positions and punish them to save the people from unnecessary problems. In a no-nonsense speech, which registered it’s message in no uncertain terms, Wakil warned the detractors that the people of Zanzibar were wide awake and were waiting for them. The people were alert and would crush any move to undermine their unity under the leadership of the CCM Party. He added that some external enemies were using local agents and the media to create dissent between the people of Pemba and Zanzibar as well as between the Isles and the Tanzania mainland. Whatever their pretexts, he said, those trying to destabilize the political setting in Zanzibar were colonial agents who wanted nothing less than the re-introduction of foreign rule and feudalism. Zanzibar had not achieved miracles (in recent years) ….. but the basis for an egalitarian society had been firmly laid and is discernible through improved health, education, better communications and transport, reliable power supply and enhanced agricultural and industrial development. Above all, there had been the unprecedented revolution in the democratic process whereby, now, people had a full share in the decision-making mechanism, whose policies are governed and implemented by the people’s own institutions”. Mr. Seif Shariff Hamad was replaced as Chief Minister by Dr. Omar Ali Juma (47) who was previously Principal Secretary in the Zanzibar Ministry of Agriculture, Livestock Development and Natural Resources and also comes from Pemba. Dr. Juma obtained a Doctorate in Veterinary Medicine from the Moscow Veterinary Academy together with an MSc degree during the period 1961 to 1968. He took a post-graduate degree in Tropical Veterinary Medicine in Edinburgh between 1976 and 77. He has also studied at Reading University. He is married with eight children. At the time of writing – early April 1988 – calm seems to have returned to Zanzibar. If indeed it ever departed. The new Chief Minister appears to have been making a good impression with an energetic and no-nonsense approach. In recent speeches he has been quoted in the Daily News as having said : “The time has gone for the Youth Organisation VIJANA to prepare long and impressive messages at public rallies”. It seems that there has been too much political passion in Zanzibar during recent weeks and that there is a good chance of things now settling down. The former Chief Minister appears to have been over-ambitious in his pursuit of his policies, somewhat impetuous and lacking in the spirit of compromise necessary if progress is to be made in a divided country. One must wonder whether, in certain of his public statements, the President also might have over-reacted. Meanwhile, in London, senior Government officials, asked to comment on the Zanzibar events, pointed out that what had happened was that a new Chief Minister had been appointed and a few Cabinet changes had been made. There was nothing unusual in that. In neighbouring Kenya, at about the same time, the country’s Vice-President had also been removed from office and given a post of lower status. And the Zanzibar Government has indicated that the former Chief Minister remains a free man and is continuing to represent his Mtambwe constituency in the Zanzibar House of Representatives. The World Travel Fair, held in London from December 1st to 6th 1987, has become a dynamic force for the development of international tourism and no country which wants visitors can afford to neglect it. It was therefore a sign of positive progress to see a Tanzanian stand at the Fair. Previously, the other countries of Eastern and Southern Africa have had it all their own way. But, at last, Tanzania joined them, with a stand on the upper floor at Olympia, very near the stands of Zimbabwe, Botswana and Kenya. The Manager of the Tanzanian exhibition was Mr. Amant Macha, the Director of Marketing of the Tanzania Tourist Corporation and I spoke to him about the principal aims of Tanzania’s tourist effort. First of all, he made it perfectly clear that Tanzania had neglected tourism for far too long and had now set itself very definite targets for the years ahead. Although tourist development was still in its infancy, Mr. Macha thought it possible that the number of tourists could increase to over 200,000 by the early 1990’s. The second priority for Tanzanian tourism is obviously the construction of far more hotels and motels, catering for a wide range of tastes and income brackets. In the short and medium term Mr. Macha thought that the country must aim at what is usually called the upper middle class of the market. Visiting Tanzania for a fortnight or three weeks and viewing the safari parks is not going to be cheap and any thought of mass tourism packages 1s not being considered at present. Mr. Macha’s final theme was that Tanzania needed to concentrate on two main areas, firstly, wildlife and secondly, Kilimanjaro. Judged by these aims the Tanzanian stand had done moderately well. It had displayed well designed and photographed wall posters concentrating mainly on the game parks and mountains. There were also two British tour managers on hand to explain Special Interest holidays to visitors. But there is clearly a great deal more to be done before tourism is launched on a wide scale. Several questions remained unanswered. How ‘international’ are the hotels already in existence? Do they offer a wide ranging cuisine? Can they give a distinguished and reliable service? Even more important, is there a good car-hire service and is there a decent network of roads and sufficient travel information for a visitor to take his family on their own tour through the country? There was a great deal spoken by all the officials on the stand about the beauty of Tanzania’s wildlife. But what of the coast? The discerning visitor wants to see mountains, wildlife, beaches and, not least important, he wants to meet the people. Tanzania has to realise that other countries very near it have a huge head-start in the organisation of their tourist industries, and the competition is not only keen, but getting tougher all the time. Clearly, much good work has been done in the past year and the participation in this Travel Fair will have done much to strengthen the links which have just been forged with some of the world’s leading tour operators. But it is absolutely essential to open up the whole country to international visitors and to provide as free and friendly a holiday visit as possible if Tanzanian tourism is to thrive. State tours are really no substitute for freedom of choice. But the potential is huge. Tanzania is arguably the most beautiful and varied country in the African continent and the coloured posters at the back of the stand took me back twenty-five years to my first visit to that truly enchanted land. Wild buck leapt from darkness to light and then back into the semi-shadows; rivers gleamed and flashed in the early morning sun; Makonde carvings displayed in abundance, spoke of a rich cultural heritage which no discerning visitor could ignore. And, overall, Mount Kilimanjaro shone radiant, with white snowy flanks. It seemed irresistible. One visitor to the stand summed it up exactly. “It all looks so marvellous and so new. I didn’t know until today that you could really visit Tanzania”. That, perhaps, is the strongest card that Tanzania can possibly play in the tourism game. Its new. The great novelty of going there and seeing something absolutely fresh is undoubtedly the best weapon in the armoury of the Tanzania Tourist Corporation. It will be interesting to see how skillfully it plays it in the years that lie ahead. One of Tanzania’s most important political landmarks, at least on paper, was the publication of the 1967 Arusha Declaration. The Arusha current manifested its far reaching waves in works of literature and the arts. Some artists laid all their hopes in the Declaration and, thus, sang or wrote its praises. Others had the ‘let’s wait and see attitude’ and, therefore were left as bystanders watching by the roadside. Yet others were sceptically critical from the very beginning and did not agree to swallow wholly the words of politicians. These groups did not emerge only in poetry as some erroneous views seem to suggest. Tanzania, which had been regarded as the driest patch in what Taaban Lo Liyong had termed in the sixties ‘the East African literary desert’ was emerging as a gigantic and very important oasis of a written, indigenous African language literature. Many works poured out in prose, poetry and drama. Obviously, Taaban’s was an artificially created barrenness as it ignored completely the rich and abundant oral literature of hundreds of ethnic groups in East Africa and over-worshipped written literature. Theoretically, largely due to the Declaration, Tanzanian literature was now overloaded with the call to go back to the village. A theme that had been initiated antedatedly in Shaaban Robert’s novel ‘Utobora Mkulima’, (Utobora the Farmer) got new blood in such works as Penina Muhando’s play ‘Hatia’ (Guilt), Ndyanao Balisidya’s novel ‘Shida’ (Hardships), in Kathias Nyampala’s ‘Ngonjera’ poems and in hundreds of poems written in Tanzania’s dailies and weeklies and on Radio Tanzania. Different music bands, choir groups and such prominent fine artists as Sam Ntiro increased the impetus of the theme by s pecialising in it. Thus the period immediately after Arusha up to the mid-seventies is full of works of art and literature that are mainly concerned with content. It is at this time that one finds the artistic level of the written works at its shallowest. Even such a fine work as Muhando’s ‘Hatia’ is marred, as its creator gives us a very contrived solution to her heroine’s predicament – to go and join the villagers in the newly formed Majogo village. Ironically, it is also at this time that the concept of the village, the Ujamaa village especially, is portrayed as a conglomeration of, among others, all those ‘thugs’ and whores who have been failed by town life. The artistic failure of the works in this trend keep on surfacing in literary pieces whose creators are led by the nose by political and ideological ideals at the expense of appropriate artistic standards. Perhaps the most glaring examples here are J. K. Kiimbila’ s ‘Ubeberu Utashindwa’ (Imperialism will be Vanquished) and F.E.M.K. Senkoro’s ‘Mzalendo’ (Patriot). These two novels deal with the liberation struggle in such a manner that the reader feels that he has been reading political treatises rather than works of art. K.K. Kahigi’s and Ngemera’s play ‘Mwanzo wa Tufani’ (The Storm’s Beginning) and Mohamed Seif Khatib’s epic poem ‘Utenzi wa Ukombozi wa Zanzibar’ (a poem on the liberation of Zanzibar) are two other works worth mentioning here. While the former emulated the Arusha and Ujamaa sloganeering, the latter was, in earnest, just a description of important successive events in the history of Zanzibar. Following suit are the novels of Shafi Adam Shafi ‘Kasri ya Mwinyi Fuad’ (the Luxurious Palace of Fuad, a Feudal Lord) and ‘Kull’ (Coolie). The latter, though, has one merit in that it was the first major literary work in Kiswahili that did not advise the worker to leave the city and go back to the village. The first ever collection of poems in English written by young Tanzanian poets ‘Summons: Poems from Tanzania’ has an introduction that quotes, among others, Mao Tse Tung on the importance of high artistic quality that matches progressive ideas in literary works. However, a closer look at most of the poems in this anthology, shows, with all due respect, a very poor artistic standard. Obviously, this was an aftermath of Arusha, for as we are told in the introduction, this is a new generation of poets who ‘started primary education after Uhuru, secondary education after Arusha’. Lastly and perhaps the most typical of all in terms of sloganeering and parroting, was the anthology of poems that dealt with the Arusha Declaration and ten years after: ‘Mashairi ya Azimio la Arusha Baada ya Miaka Kumi’. In this anthology representative poets like Shaki, for example, claim that everyone in Tanzania, thanks to the Declaration, is extremely healthy due to having too much to eat! Tanzanian literature has grown in various phases out of the process of negation. (This concept is not in the strictly Hegelian sense but rather loosely implies the process under which one type of literature emerges and takes the place of the type before it). Thus, as an indirect protest against, and negation of, the above trend of artistic bankruptcy, there were a number of developments in the literature. Three major groups can be randomly identified. The ‘popular’ cluster, the satirical clique and the free verse poets. Tanzania’s ‘popular’ Swahili literature was the most attractive and consisted mainly of potboilers, cheap books, junktales and sexploitation. This, in direct opposition to the content-oriented works, aimed at the audiences glands, fascinating their minds and exciting their flesh through the sensational and sentimental rather than the intellect. Popular variants of magazines such as Sani, Fahari, Ulatati and even the Party weekly Mzalendo became the major outlets for such ‘popular’ authors as John Rutayisingwa, G. Twarindwa, Mbunda Msokile and others. Love thrillers like J. Simbamwene’s novelettes ‘Mwisho wa Mapenzi’ (the End of Love) and ‘Kwa Sababu ya Pesa’ (Because of Money) emerged as short lived best sellers. In these ‘popular’ pieces, and through them, one noticed a distortion of social reality. How fair is it to take these works as ‘popular literature’ when, by all standards, they are just cheap potboilers? Popular literature should suggest contemporary literary tastes and the needs of the masses in terms of improving their standard of living and making them understand their environment better so that they can change it. The works cited above do not fulfil the above noble task. Rather, they continue leaving the masses in the prison of their predicaments. The ‘popular’ trend was part and parcel of ‘mass production’ which, by its nature, turned everything into a commodity ready for sale in the capitalist market. The trend was a direct consequence of the preceding one; it was an immediate negation of a former, content-oriented literary movement. The second major group that emerged with quite a force was that of the satirical artists. These filled Kiswahili literature with biting satirical voices which, in a way, portrayed the hypocrisy of those in power who were pretending to be serving the Declaration, and thus, the masses. Examples in which satire appears in combination with other literary modes can be seen in Harrison Mwakyembe’s novel ‘Pepo ya Mabwege’ (Fools Paradise) and in C. G. Mumg’ong’o’s ‘Njozi Iliyopotea’ (A Lost Dream). These novels portray the gluttonous corruption of the ruling clique who are busy swindling even the little that the poor man is supposed to have. Yet the works show how, ultimately, these greedy skunks are merely enjoying a fools’ paradise which is very short lived. One discovers in these novels ‘exposure by ridicule’. In short stories like those of G. Ruhumbika in his two works, ‘Parapanda: Wali wa Ndevu na Hadithi Zingine’ (Horn: Rice from the Beards and Other Stories) and the hilarious and most successful one both artistically and in content, ‘Uwike Usiwike Kutakucha’ (Whether You Crow Or Not It Will Dawn) one finds whole piercing satirical pieces which mock at the out-moded culture of society’s gluttonous leaders. As in the case of the ‘popular’ literature , the satirical literature seems to have emerged as a negation of the content -oriented sloganeering literature discussed above. There was a need to have a more lively form to make the social and political measures interesting to the audience. There was, for example, a need to make the audience laugh at themselves and, in the process, prescribe some kind of panacea. There was no better medium here than the satiric voice. Satire is peculiarly one of the arts that presupposes a body of settled social and political standards which shall serve as sanction for its rebuke and, at the same time, a certain security and tolerance in the application of the standards. The Arusha Declaration set those standards and artists were keen in following the implementation of the Declaration’s objectives. Almost immediately after the Declaration’s proclamation some greedy leaders began going against the standards set by the blueprint. This is clearly and hilariously shown in the play by Penina Muhando and Amandina Lihamba ‘Harakati za Ukombozi’ (Liberation Struggle). In this play one discovers humorous ridicule and rebuke containing a demand for correction from those who have betrayed the Declaration. Edward Rosenheim insists somewhere that satire can be identified partly by its concern with historic particulars. If we find no such particulars then, insists Rosenheim, a work is NOT satire. In other words satire must ask historic whys and, if possible, answer them. Isack Mruma in his novelette Nguzo ya Uhondo (Pillar of Luxury) rather than ask the whys portrays the historic hows. In this work we meet the major character Lord Madengu, already dead from the very first chapter. The humorous ridicule comes out clearly in the commotion that follows the death of this Minister who, incidentally, and against the spirit of Arusha, is also Director and shareholder in various capitalist enterprises. The radio stops its normal broadcasts and plays soft, mournful army tunes bracketed by eulogical outbursts about the late son of the nation who died while building the nation. There is further hurly-burly among university students, some of whom are for and others against the late leader. There is tumult among the peasants and even amidst drunkards, the latter openly declaring that the death does not affect them so long as they are left alone with their illegally brewed gin. Meanwhile eulogies continue pouring out from the radio. The truth of the matter, however, and this is the satiric point that the author wants to drive home, is that the Honourable Minister died just when he was completing his eighteenth beer in the Mlimani Hotel! Following suit are Penina Muhando’s play ‘Lina Ubani’ (There is a Panacea) and E. Kezilahabi’s play ‘Kaputula la Marx’. The former portrays the traditional enmity between politicians and experts. The latter shows the plight of the intelligencia in a corruption ridden society. The whole play takes place in a prison cell where the prisoners, locked up after trying to stir up some unrest in the country somehow drill a hole in the wall and are able to perceive what is going on outside. The above works show how angry the artist’s sensitive pens have grown towards people, ideas and institutions that have betrayed the Arusha Declaration. The pens’ assaults and attacks have been directed to persuading the audience to view, and if possible, act unfavourably towards those satiric objects. The comments made in the extracts from the media which follow – and indeed articles in other sections of the Bulletin – do not necessarily represent the views of the Britain-Tanzania Society. They are published to illustrate the impressions of various writers on what they have seen and heard about Tanzania. Under this heading the Independent stated on December 14th 1987 that three staunch socialist ideologues of Tanzania’s ruling party had lost their ministries in a cabinet reshuffle and had been replaced by men more sympathetic to President Mwinyi’s pragmatic economic policies. ‘The three ministers have been identified for some time as obstructing the liberalisation policies of President Mwinyi and their removal will allow those policies to reach the vital areas of industry, trade and tourism which they controlled. The ministers are Kingunge Ngombale-Mwiru, Minister for Local Government and Cooperatives, whose wish to concentrate on Party work partly prompted the changes, and who is replaced by Mr. Paul Bomani; Daudi Mwakawago, Minister for Industry and Trade, who is replaced by Joseph Rwegasira; and Gertrude Mongella, Minister for Lands, Natural Resources and Tourism who is replaced by Arcado Ntagazwa’. Msuya never suffered fools gladly and his attitude, along with his theories, finally cost him his seat on the central committee. Remaining as Finance Minister – unless Mwinyi decides on a reshuffle, which is unlikely at this stage – Msuya will continue to negotiate with the IMF and pursue the government’s liberalization policies. After the Dodoma conference, life returned very much to normal. Nyerere and Mwinyi dominated the newspapers like nothing had happened. However, political analysts are attempting to decipher what lies ahead for Tanzania. With the reformers rejected by the party hard1iners who held sway in Dodoma, the socialist path will be pursued with ‘moderate to hesitant’ reform. With Msuya on the outs, nothing is certain in the long term regarding the IMF, although the new loan 1s encouraging news. The big question now is who will lead the new vanguard of Tanzanian politics into the next century. The finger has been squarely painted at Joseph Warioba, present Prime Minister and a Nyerere stalwart, who, like Salim Ahmed Salim, is favoured by the boss. However, unlike Salim, he will win universal appeal as a mainlander if he is nominated for the presidency. A common theory is that this will occur in 1990 when President Mwinyi finishes the first of his two-year terms’. Peter Godwin of the Sunday Times has been visiting Tanzanian troops in Mozambique. He said that he was the first foreign newspaper journalist to do so and wrote as follows on January 24th 1988. ‘A contingent of 6,000 Tanzanian soldiers 1s all that prevents rebel troops in Mozambique overrunning the strategically vital province of Zambezia and slicing the country in two. As the struggle to control (Mozambique) continues refugees are streaming into heavily fortified towns to look for food, shelter and protection. Privately the Tanzanians admit that they have no hope of winning the war. Mopeia, which used to be a prosperous district capital and centre for sugar estates was captured by Tanzanian troops a year ago. Today the only safe way in is by air landing at a rough landing strip covered in hip-high grass. From the air the Tanzanian defences are clearly visible; deep trenches and bunkers forming a circle round the ruined town centre. The refugees build grass shelters around the town centre and try to grow maize to help feed themselves. Tanzanian officers, speaking on condition that they would not be identified, said they estimated that 80% of the civilians supported the guerrillas. They do not cooperate with the Tanzanians, with whom they have no common language, and often deliberately mislead them. ‘Half the women and childreen who take refuge here probably have sons and fathers fighting with the rebels’ said one officer. ‘We trust none of them. It’s difficult to tell who are rebels and who are civilians’. ‘This is a civil war – we can’t win it for Frelimo’ one soldier said. More than 500 troops defend Mopeia and its swelling population of 22,000 ‘dislocados’. The only school and hospital have been destroyed and the few buildings still standing are used by soldiers. “When Ali Hassam Mwinyi, a devout Muslim, took over the presidency he followed more or less the same tolerant approach as Nyerere, a devout catholic. His only apparent departure was to appoint a Muslim Minister for Education, a post to which Nyerere traditionally appointed a Christian, presumably because of the many missionary schools in the country. But this alarmed the bishops and they started to wonder aloud if Mwinyi was not promoting Islam. During October’s CCM Party conference in Dodoma, a letter was written to the chairman of the party, Nyerere, by the Rev Christopher Mtikila. It openly and maliciously attacked Mwinyi and his administration, accusing him of being anti-Christian, of conspiring to promote the spread of Islam at the expense of Christianity and to the detriment of the people of Tanzania. He all but accused Mwinyi of being under the influence of Ayatollah Khomeini of Iran’. But, as A.M. Babu pointed out in the article, the regime in Tanzania cannot be anti-Christian when the chairman of the ruling party is Nyerere. “To accuse Mwinyi’s regime of being anti-Christian is to accuse Nyerere of being anti-Christian as well, which is absurd”. mutter ‘good show’ and pulverise whatever unwary beast was driven into his sights. In truth, however, East Africa tormented travellers with mosquitoes, snakes and tsetse flies, to say nothing of biologically complicated water and roads that defied reason. Few tour companies have so successfully overcome the discomforts of the safari as Abercrombie and Kent International (well known in Kenya), a firm which is now offering the (Kenya) style of travel in neighbouring Tanzania. They have named the trips after Ernest Hemingway, a committed big-game hunter who thought himself as much a marksman as an author. (In the Serengeti) at sunset, the sun takes on colours from cherry-pop red to iridescent orange, lighting the sky like a forest fire, and then the wind comes up, the heat drops and the animals start moving, heading wherever animals go in the night”. Readers of the magazine were advised that they could obtain further information from the Tanzanian Mission in Tokyo, 21-9, Kamiyoga, 4-chome, Setagaya-Ku, 03-425-453103. According to Richard Dowden in the Independent IS TANZANIA SO SPECIAL? “It is true that there are problems prevailing in our country. There are drunkards, executives who think they own public institutions, people who build houses randomly etc. This is not strange! Even in thoroughly developed societies you find some big people are accused of taking heroin; some responsible people in Government are gay; some even involved in dangerous scandals. This is not new in developed countries like the USA. Then what is so special for a poor country like Tanzania! What the writer wrote was just a repetition of what the Government is trying to remove. Remember President Mwinyi’s Iron Broom and other related actions taken by the Mwinyi administration. Does the so called Mwananchi want the Tanzania Government to hang people in order to remove tips and handshakes? Or is he interested in Sharia laws or firing squads? According to New Africa’s January 1988 issue, Dar es Salaam Port is already on a par with Mombasa Port in terms of efficiency and it could soon overtake its Kenyan counterpart. “New construction well underway and a new streamlined method of cargo handling is speeding throughput”. Until recently the port’s biggest drawback was the lack of cranes which could lift the containers carrying most of the cargo. Only ‘self-sustaining’ ships with their own cranes on board could load or unload containers in the port. Now, two ship-to-shore cranes are being installed and there is provision for a third. Many other improvements are planned including a new dhow wharf. Several donor agencies are assisting in the work in view of the importance of the port, not only for Tanzania, but also for other countries of southern and central Africa which use some 50-60% of the goods passing through the port. African Concord’s cover story on Health Care Delivery (February 12th issue) included three stories on Tanzania. The article went on to explain that the main thrust of Tanzania’s ‘Health for All by the Year 2,000 Programme’ is the laying down of a sound mother and child health care service. “The Health Ministry estimates that a child dies every 15 minutes in the country – a victim of the six preventable diseases measles, tuberculosis, polio, whooping cough, tetanus and diptheria. All in all, for every 1,000 births, 137 children die before the age of five. According to the 4th March 1988 edition of the African Economic Digest the Tanzania Sisal Authority has completed the sale of 10 of the 13 sisal estates it put on the market in 1986. The estates, which have mostly gone to local companies, cover a total of 20,300 acres. The sale agreements are believed to stipulate that a percentage of the land remains under sisal. Many buyers had been keen to obtain the estates in order to grow other crops. Joint venture partners are still being sought for 24 other estates. Exports of raw fibre have remained stable but the market for finished products such as baler twine and carpets has increased significantly and much better results are anticipated from the sisal industry this year. Fish Farming International in its December 1987 issue discussed the various attempts being made by foreign donor agencies and churches to help in the development of fish farming. Agencies mentioned included the US Peace Corps (14 volunteers working with Fisheries Officers), the Lutheran Church and the Christian Refugee Service (helping with extension), the Anglican Church (a fish farming development programme including a demonstration farm near Dodoma), the Church Missionary Society, the Anglican Church of Canada, the United Methodist Church of the USA and others. Since 1984 the Dodoma demonstration farm has used integrated duck-fish ponds where Peking ducks live in slatted floor houses over the ponds. The ducks thus fertilise the pond water with a resulting improvement in Plankton and algal growth on which the fish feed. Re “Menace of Desertification in Iringa District” in the last Bulletin, feel that some assurance is needed about the vast quantities of wood used by the Southern Paper Mill from the Sao Hill Forest Plantation and about protection of the old Mufindi Rain Forest. There is a project write-up of the Mill called ‘Paper at any Price’ by Anthony Ngaiza in Towards Sustainable Development published by the Panos Institute. It is stated that at full production the Mill requires 300,000 m3 of wood per year. There are some 90,000 ha of pine and eucalyptus trees to be harvested and the Government plants about 1,000 ha per year. In another paragraph it is stated that by the year 1991 the Sao Hill Plantation will cover 65,000 ha. Does this mean that 25,000 ha are being lost? The Mufindi Rain Forest lies close to the Mill and I hope that this is not being further destroyed. Much must have been lost to tea plantations, commencing in pre-war days. This forest must be of important environmental/ecological value and ought it not to be protected, if it is not already? I gave a talk the other day to a geography class and told them that literacy in Tanzania was over 60%. A young boy challenged me by quoting from the book Understanding Human Geography by Michael Raw which states that the rate is 10% Can you give me the up-to date figure. Yes. Dr. E. D. Mwaikambo, Secretary of the Tanzanian Chapter of the Society, bas checked with the Ministry of Education in Dar es Salaam. The present figure is 90.4% It varied in 1986 from about 99% for men in Dar es Salaam to 83% for women in Shinyanga – Editor. WHAT IS IT LIKE TO LIVE IN TANZANIA? Thank you for Bulletin No. 29. 1 liked the articles – the one on the re-election of Mwalimu Nyerere was especially interesting. Were you there? It seemed so from your article. (Unfortunately not! – Editor). I would appreciate some more regular articles on what it is like to live in Tanzania. I was last there in 1984. For example: What is the price of various essential commodities maize flour, rice, soap, petrol, meat? How are salaries changing if at all? And other matters that would concern socialists who would like to go back to live in Tanzania. (The recently announced controlled price of first quality printed Khangas is Shs 536; one Pilsner beer costs Shs 80. The current exchange rate is Shs 169 to £1 (mid-April 1988) Perhaps someone in the Tanzania Chapter could help us with answers to the main questions you asked? celebrated Uhuru here in the colleges. The Catering Department of Westhill had laid on a buffet and we had a most enjoyable time with music, speeches and recitation of poetry. Hakiku twaiheshimu, siku hii kwa mamia. Wahenga waliyafyeka, mapambano mia mia. Selly Oak twakumbuka, Uhuru wa Tanzania. Selly Oak twakumbuka, Uhuruwa Tanzania. Siasa yenu ya kasi, Uwanja inawekewa. Wang’oke kwa msururu, kucha kutakavyokucha. Ondoa vyako vishoka, Umma upate sikia. I have seen the letter in the last Bulletin about the Makonde and the Mawia. I am a Makonde from Newala. When I went to school I first met the Mawia people who came from Mozambique. They were escaping from the war. We were very cautious and afraid of them. They were a fierce tribe. There are differences between Mawia and Makonde. We never had incisions on our faces – not even my grandfather. Nowadays they try and assimilate with us and in Dar as Salaam and Tanga they call themselves Makonde .. Francis Libungo. (We have spoken to other persons who insist that the Makonde and the Mawia are one and the same – Editor). Among the rare references to Tanzania in the press in this country and abroad a common theme has recently been the state of conflict which is said to dominate the relations between President Mwinyi and Party Chairman Julius Nyerere. The Independent, for example published on December 30th a highly imaginative article bearing the sub-heading ‘The former President is using his prestige in a bid to curb the liberalising trend fostered by his successor’. But the presumption of conflict is highly misleading. The President and the Party Chairman are not, of course, alike either in experience, or in temperament. Nyerere, as his writings testify, is a thinker and a visionary of outstanding quality; Mwinyi, so far as we yet know, is guided by an acute practical assessment of the needs of the moment. But it is needless to assume that these contrasting qualities inevitably presuppose conflict. Nor is a discontinuity in national economic policy at the time of the change over in the presidency to be inferred. While greater recognition is now paid to the operation of market forces and the role of the private sector is openly acknowledged, these trends cannot be interpreted as symptoms of conflict between President and Party Chairman. The vision of greater cooperation and equality as the ultimate goal remains in place, unobscured by changes that have been made in response to the country’s critical economic situation and the pressure of world forces. The Economic Recovery Programme on which Tanzania is now embarked, was approved by the Party under Nyerere’ s chairmanship. Moreover, certain aspects of policy, including the sale of derelict sisal estates to the private sector and the retention by exporters of a proportion of their foreign exchange earnings, had already been promulgated while Nyerere was President. Neither Nyerere nor Mwinyi has abandoned a critical view of the IMF, though the introduction of a structural adjustment facility is acknowledged to be a step in the right direction. Fortunately, though the IMF initially played a leading role in respect of support for the ERP, it emerged as a junior partner in the pattern of support that resulted. Speaking at the University of Dar es Salaam in September 1956, Mwalimu Nyerere called for the full participation of the private sector. While insisting that within the socialist policies of Tanzania major sectors of the economy must remain under public control, he said that private individuals and companies must also be given scope to perform the services that the state could not accomplish. As to the loss making parastatals, he said, that they were a serious drain on the nation’s resources and that it was neither disloyal nor anti-socialist, to require them to make profits that could be beneficially reinvested in the economy. It is in fact difficult to find in the public utterances of Nyerere anything that is substantially at odds with the known views of Mwinyi. Nyerere is sensitively aware of the discordant role that a former President might play. His continuation in office as Chairman represented a reluctant decision made only on the insistence of President Mwinyi and in view of the extremely heavy burden of work already falling on the shoulders of the President in carrying out the difficult political task of organising Tanzania’s economic recovery. Conflict is more sensational and apparently more ‘newsworthy’ than co-operation. I fear that the imaginings of anonymous correspondents and diplomats speculating about the interaction of these two distinguished men caught in a formal relationship that is, to say the least, unusual have been allowed to make up for the shortage of hard news. I would be grateful for your help in putting a contrary view. The ‘Friends of Ruaha Society’ would like to express its thanks and appreciation to those generous readers of the Bulletin who made donations to the society following Colin Imray’s letter in the May issue. We would be delighted to hear from any other readers who have an interest in the Ruaha National Park. The September issue of the Bulletin carried an interesting letter from Brenda Bailey concerning the management of National Parks. Perhaps I should explain that ‘Friends of Ruaha’ is not primarily concerned with theoretical management issues. Management decisions are made by the Chief Park Warden and the Director of National Parks. Our job is to help. We have provided fuel, oil, spare parts, boots, cement, rewards for rangers, grader blades, funds for fire control, road construction, anti-poaching, general repairs and maintenance. We have just approved a request for funds to build a new permanent ranger post. This is the practical side of running a park. Ruaha is an area the size of Wales with fewer than fifty rangers. Tanzania has eleven national parks – a tremendous commitment to the world’s wildlife heritage. The resources to divide amongst them are slim. We are able to help the park through donations from the public and our responsibility is to ensure that those donations are used effectively. If Brenda Bailey would like to donate some copies of Managing Protected Areas in the Tropics we would be delighted to pass them on to the park. For the £18.50 that the book costs we can buy six pairs of ex-army boots – rangers cannot wear ideas. That having been said, we did discuss with the Park Warden the idea of visits to the park from schoolchildren in the surrounding Villages. Such visits have been paid in the past but lack of transport prevented them from continuing. We are now looking at the cost of hiring the Idodi village bus in the hope that ‘Friends of Ruaha’ can support more visits in the future. To do this we need your help. The Tanzanian High Commission in London has announced that President Ali Hassan Mwinyi will be paying an official visit to Britain from June 6th to 10th 1988. He will be lunching with the Queen and having extensive discussions with Mrs. Thatcher. It is also expected that, amongst his many other engagements, he will be meeting members of the Britain-Tanzania Society. According to SHIHATA the World Bank is so pleased with Tanzania’s economic recovery that it is now working on new programmes to stimulate production in the country’s priority areas. “The results of the Economic Recovery Programme have been encouraging and we would like to further assist the Government to get the economy growing at a sustainable pace” said Enrique J Rueda-Sabata, the Bank’s Deputy Representative in Tanzania. “The Government has to be congratulated” he said. The eleventh anniversary of the CCM was celebrated on February 5th this year in Tabora. There were two new features to the celebrations. Some 7,000 Sungusungu (Traditional guards) clad in rugs and hats made from feathers paraded past Party Chairman Nyerere. They danced, flexed their muscles and stamped the ground and displayed their weapons – bows and arrows and pangas. These traditional groups had been formed five years ago and have had much success in stamping out cattle rustling and tracking down criminals. “It is quite clear” he went on, “that the word has a broad meaning quite apart from its colonial connotations, KNCU (1939) and KNCU (1984) to me are nostalgic. They remind me about the period up to the year 1976 when the co-operative movement of Tanzania was leading in Africa, Why did the founding fathers opt for ‘Native’ or ‘African’ Co-op Union? For the under thirty years age group let me explain that the ‘Natives’ had little choice in the matter because of the segregative racial policies of the colonial authorities”,. and it was therefore a fitting symbol of protest for Africans to start and run their own cooperative union so successfully right under the nose of the colonial master”. This is one of several jokes that could be heard in Tanzania directed against the Socialist development strategy. This strategy is now being changed. Why are the changes being made and are the new policies proving successful? The above quotation is from the 1987 Nobel Prize-winner in Economics, Robert Solow. It serves to illustrate the dislike of Neo-classical economics in some quarters. Neo-classicism economics argues that competitive markets, with firms striving to maximise profits, lead to the most efficient use of a country’s resources. In the 1950s and 19605, the general feeling was that free markets and private enterprise did not meet the development needs of poor countries, The criticisms that economies did not function as Neo-classical theory demanded and gave rise to unacceptable income distributions, carried the day. The advice offered was that government intervention by way of planning, fixing prices, and running productive enterprises would increase the pace of economic development and ensure that the distribution of income was fair. These views were nowhere more apparent than in Tanzania’s Ministries and in the University of Dar es Salaam. At Independence there were precious few Tanzanian economists working in senior positions in government. It was the political Scientists, sociologists, lawyers and historians, stiffened by expatriates attracted by Tanzania’s commitment to African Socialism, who were giving the lead on development policies. The Socialist commitment of the University was reflected in the policy that staff going to study or research abroad should go to Eastern Europe or the Soviet Union. No African country pursued non-market ideas more vigorously in this period than did Tanzania. Under the Arusha Declaration there were widespread nationalisations and people were grouped in villages and encouraged to farm collectively. The prices of some 3,000 items were fixed by the authorities. Foreign investment ceased and imports were controlled. While Tanzania was implementing these policies, the economy was buffeted by a series of adverse external shocks which included the oil price rises of 1974 and 1979. drought in 1975 , the break-up of the East African Community in 1977, and the war with Uganda in 1979. After good results in the 1960’s and satisfactory results in the 1970’s Tanzania’s economic performance began to deteriorate seriously in the 1980s. During the 1970s mainstream development economists had begun to change their ideas. Two decades of ineffective planning, and expanded, corrupt bureaucracies led to the realisation that planning failures might lead to worse economic performance than inefficient markets. Developing countries which relied on international trade, and had strong private sectors, such as Singapore, Hong Kong, Taiwan, Singapore and South Korea, and in Africa, Ivory Coast, Malawi and Kenya, had done well. Certainly the market mechanism had a lot of flaws, but the message seemed to be that economies expanded output faster with less government intervention. And although the rich might get quite a bit richer, the poor get better-off as well. All Hassan Mwinyi took over as President of Tanzania having had a record which reflected mild encouragement for the role of the private sector. Any changes in economic policies were expected to be minor, at least until Nyerere relinquished the Party leadership. In the event, the changes were sudden and extensive. In June 1986, Tanzania came to a new agreement with the IMF. Tanzania had to agree to undertake reforms that would bring the economy more under the control of market forces. This meant a reversal of the Socialist strategy followed since 1967. But it is also clear that there is a huge gulf between the Government and the Party on economic strategy, and this split poses a problem for the Government, bound as it is by Party directives. In this context Nyerere’s role as Party Chairman over the next five years is likely to be critical. One view is that he will use his position to reign in Mwiny’s reforms. The other is that he supports the reforms, and that as Party Chairman, reinforced by the immense respect in which he is held, he will be able to ensure that the Party does not thwart Mwinyl’s plans. The eighteen-year-old Tanzanian on the bus from Nairobi to Dar es Salaam described himself as a businessman involved in the export-import business. In the luggage compartment of the bus he had 400 pairs of plastic sandals purchased in Nairobi for Ksh 7 a pair. They should be sold for Tsh 300 a pair in Dar es Salaam. At the time, the official exchange rate was Tsh 3.3 = Ksh 1, with the black market rate at around Tsh 6 = Ksh 1. The importer had official documents allowing him to import goods into Tanzania, but he was not allowed to purchase foreign exchange with Tanzanian shillings at a bank. So as the bus entered Tanzania, he changed money for travellers, giving them favourable black market rates for their Kenyan shillings. Here’s how the transactions work out. The consignment of sandals cost the equivalent of $US 200. They would be sold for a equivalent of $US 1,333 when the Tanzanian shillings are converted at black market rates. Expenses such as bus fares both ways, bribes at border posts and road blocks and accommodation in Nairobi and so on would be under $US 100, giving a profit of well over $US 1,000. One trip a week would yield an annual income of $US 50,000. The initial reaction to the changes has been very favourable. The trade liberalisations have made basic commodities more readily available. 1986 saw the first rise in Tanzania’s living standards since 1981. Despite these encouraging beginnings however, there is a long haul ahead. For the past twenty years the best economics graduates have been studying in America and Europe where they get a thorough training in Neoclassical economic theory. They appear to have enjoyed themselves and liked what they saw of market economies. Their experience is in marked contrast to those who went to Eastern Europe and the Soviet Union. As well as the burden of having to learn another language, they have been unhappy with living conditions and dismayed to see how poorly the industrialised planned economies perform. The experiences related on their return have led to the best graduates opting for study in Europe and America. Western trained economists are now in senior positions in the key Ministries, and in the University. Visiting officials and academics have observed that the present group of economists in Tanzania are the most able in Africa. The new generation of Tanzanian economists do not feel that they have to persuade other social scientists that their views are correct. They have the ear of government, and their advice is that the market works and it works for everybody. Let’s hope for Tanzania’s sake they are right. Mr MICHAEL HODD teaches at the School of Oriental and African Studies and works on the economies of East Africa. He visited Tanzania in 1974, 1983. and 1986. He is the author of African Economic Handbook (Euromonitor 1986) and Editor of Tanzania After Nyerere which is reviewed in this issue of the Bulletin. Letters from Tanzania suggest that the decline in the economy has ‘bottomed out’ and that there are definite signs of incipient recovery. There is certainly more activity among producers and traders, while the response of farmers to the provisions of the economic recovery programme has caused serious crop storage and movement problems. However, in spite of this more hopeful picture, the persistent trend of price inflation remains a serious worry, particularly to those on fixed salaries. Though hitherto the Government, aided by reasonable harvests, has been successful in sustaining morale and avoiding a food crisis, it would be rash indeed to assume that the Economic Recovery Programme has surmounted the formidable obstacles that lie in its path. Of these, th8 two most urgent and perplexing are the problems confronting the rehabilitation of exports and the debt overhang. Except in 1968, Tanzania enjoyed a favourable balance of trade throughout the first decade of independence. But thereafter, for reasons that are too complex to discuss here, the trading account was consistently in the red and in 1986 export revenues at US$ 348 million were no more than one third of the cost of imports at US$ 1,047 million. This very serious outcome was the sequel to a fall in export volumes of sisal, cotton and cashew nuts, but other products increased in export tonnage, notably coffee, Tanzania’s largest export crop. For the moment the outlook for coffee is promising and indeed in 1986 a 15~ increase in exports was matched by a 130% increase in prices, resulting in a growth in earnings of 167% in shilling terms. But coffee is subject to seasonal fluctuations and in 1986 the difficulties encountered by the Brazilian crop created exceptional, though temporary, market opportunities. Over coffee, as with most of Tanzania’s traditional export commodities, hangs uncertainty about future total world demand, while increasing competition among Third World primary producers anxiously trying to rectify their trade deficits and fund their increasing burden of external debt casts additional doubt an the prospects for Tanzania’s staple export. This means that Tanzania can only hope to return to balance on her trading account through a resolute policy of export diversification in the years to come. While the trade deficit imposes an intolerable burden on Tanzania’s balance of payments, it is also the debt overhang that gives rise to special anxiety. At the end of 1986 Tanzania was in debt to the rest of the world to the extent of nearly four billion dollars . Leaving aside private and short-term obligations, about two thirds of the outstanding public debt was to other governments and one third to the World Bank and the IMF. The interest and repayment of external public debt i n 1986 consumed 15% of the income from Tanzania’s exports, a burden which , although much less than that suffered by the Sudan, Somalia and some other countries, is likely to increase with the expiry of grace periods on multilateral loans and rescheduled debts in the nineteen nineties. Same of this burden can be relieved by converting bilateral loans into gifts. The United Kingdom has already done this, but with an outstanding bilateral debt in 1986 of US$ 2.112 million there is obvious scope for further relief along similar lines. Of the debts outstanding to the World Bank, US$ 656 million was due in respect of IDA (interest free) credits, which will fall for repayment in the next thirty or forty years as grace periods expire. But no less than US$239 million was borrowed in the early seventies on so-called IBRD terms, that is, at substantial rates of interest. Some consideration is now being given to the means of alleviating this debt burden, though it is far from clear what options will be open. Of the remaining debt burden, US$ 186 million represented accumulated commercial debts subject to export guarantee schemes, that is, in effect debts taken over by governments. It is believed that the U.K. would be willing to extend maturity periods and reduce rates of interest, but the implementation of such a proposal seems to depend on an agreement in the Paris Club (the main industrial nations) and there appears to be doubt about the willingness or the legal ability of the United States to co-operate. It is of course difficult to foresee in this uncertain world the future outlook for Tanzania’s efforts at economic renewal. A downturn in the economies of the industrial nations could seriously jeopardise the prospects for many Third World countries dependent for their livelihood on the export of raw materials. The solution to the formidable balance of payments problem is still far away and exportable items and necessary commercial skills remain inadequate for the ‘purposes of a vigorous export programme. Underlying all efforts at economic renewal is the restoration and development of communications – roads, railways, port facilities, telephone and telex systems – a programme that will require years rather than :months to produce significant results. But in spite of these hindrances and hasards, Tanzania possesses two important advantages, a stable government and a buoyant state of morale. Although the short term burden of reconstruction is falling disproportionately on the urban wage earner and his dependents, the absence of ostentatious private wealth and policies such as the minimum wage legislation help to offset, if only partially, the rigours of the recovery programme. These advantages cannot be assessed in developmental terms, but they create a favourable environment for growth. It must be our sincere hope that the benefits of structural adjustment, to which the Government has committed itself, will soon accrue to those who are paying the price.